If anything, this was an indication that at least from Iran’s perspective, and arguably the Syrian government’s, the Turkish-Russian arrangement was only a stopgap, and the battle of Idlib, the rebels’ last major bastion, will ultimately be fought as Aleppo was, leading to its recapture by the Assad regime in December 2016. These comments came a few days before the terror attack on a Sacred Defense Week military parade in Ahvaz, southwest Iran, which left at least 25 dead and around 70 wounded. The Islamic State militant group (ISIS) was one of two groups that claimed responsibility for the deadly assault. Its Amaq News Agency posted a video showing three of the four assailants speaking zealously of the upcoming operation. Evidently Iran and Syria consider extremist Salafi and Wahhabi groups as a grave terrorist threat to their security. And given the presence in Idlib of at least 10,000 militants from al-Qaeda-affiliated Hayat Tahrir al-Sham (HTS) as well as hundreds of ISIS fighters, both will wage a war in the province to drive them out. Notably, they have even taken strategic advantage of these very same extremist groups to justify the indispensability of an all-out offensive on Idlib. On September 24, the Assad government reportedly transferred over 400 ISIS militants from the eastern province of Deir Ezzor near the Iraqi border to the outskirts of Idlib. For Damascus and Tehran, however, the potential campaign to retake control of Idlib is much more than about fighting terrorism. For Syria, Idlib is primarily a matter of sovereignty and territorial integrity. In late September, Syrian deputy foreign minister reaffirmed, in an interview with al-Watan newspaper, the government’s determination to recapture Idlib either peacefully or forcefully. “We will be victorious in Idlib, and our message to the involved parties is quite clear: we will enter Idlib either through peace or war.” The “involved parties” included Russians and Turks as well. 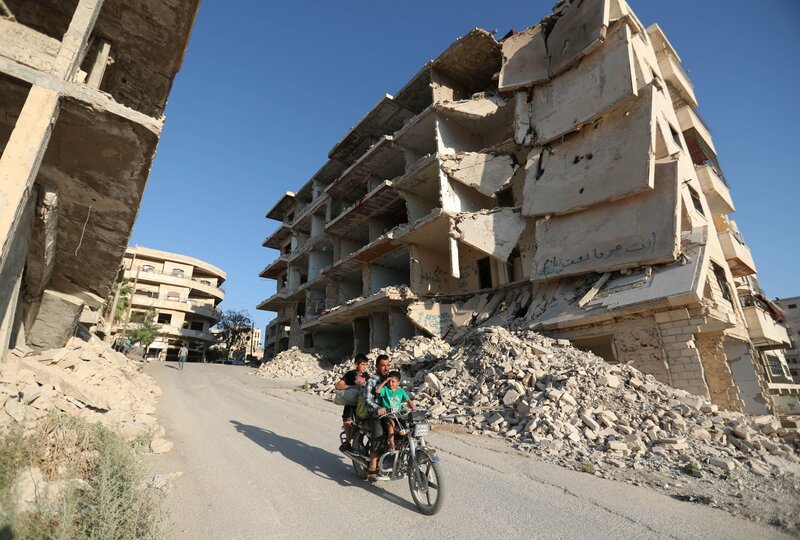 With the bulk of Syrian territory in the north and northeast under the control of Turkey-allied Sunni rebels and U.S.-backed Kurdish forces respectively, Idlib in northwest Syria is the lowest hanging fruit for the Assad regime to pick. Also, the province’s geographical position along the border with Turkey has rendered its territorial status even more critical, probably causing fears inside the government that its protracted control by Ankara-backed rebels—including the National Liberation Front formed in May 2018—could beget it a fate similar to that of the Golan Heights: first captured during war by Israel, then annexed de facto. Aspirations among some rebel groups to establish, with Turkish blessing and support, an independent “republic of north Syria” in the Idlib province—which is incidentally the size of Lebanon—have stoked such apprehensions. In the face of Israel’s highly offensive strategy to take on Iranian forces, the recapture of Idlib by the Assad regime will provide the Revolutionary Guards and allied Lebanese Hezbollah forces with greater operational maneuverability and latitude in western Syria. From this viewpoint, Idlib’s strategic advantage lies in its location deep inside the Syrian territory, close to Turkey on the one hand and to the Alawite stronghold of Latakia on the other, which altogether make it relatively more difficult for Israel to reach. Notably, for airstrikes against the T4 airbase east of Homs—allegedly a site of Iranian drone units and further in the south—Israeli warplanes had to use Jordanian airspace to enter Syria. Control of Idlib can also facilitate Tehran’s land access to the Mediterranean and its reconnaissance of Turkish moves near the Syrian border. This is of considerable strategic importance to Iran as its northern pathway or “corridor” to the sea has been hampered by the presence of U.S.-backed Kurds and Turkish forces. Maysam Behravesh is a multimedia journalist at the Iran International TV channel. He is also a PhD candidate in the Department of Political Science and affiliated researcher at the Center for Middle Eastern Studies, Lund University, Sweden. He can be found tweeting at @behmash.